This means first of all that we will not know if the Duchess will give birth in a hospital or at home at Frogmore before the birth has taken place. Secondly, there will not be a photo call outside the Lindo Wing at the St. Mary's Hospital in London like after the births of the children of the Duke and Duchess of Cambridge. However, in the same operational note the media was also told that «Within a few days of the birth, the Duke and Duchess will take part in a photo call within the grounds of Windsor Castle». And furtheremore, the media has been informed that «A large fixed position for broadcasters and reporters will be facilitated on the Long Walk in Windsor. This will only become open for access once it has been announced that The Duchess is in labour. The facility will be operational from 6am until 11pm and for up to 72 hours after The Duchess has given birth». So much for keeping the birth «secret». Of course the media – and far too many royalty watchers and «experts» – have worked themselves into a frenzy with screaming headlines about «break of protocol» and whatever. The Norwegian tabloid VG produced one of the most silly headlines ever: «Prins Harry og hertuginne Meghan vil holde fødselen hemmelig» («Prince Harry and Duchess Meghan is going to keep the birth a secret»). But then went on by saying that «Prinseparet vil vente med å kunngjøre at babyen er kommet til de selv har rukket å feire begivenheten privat», which more or less taken from the last sentence of the first quote above. If only people could calm down for a minute or two ... or three. As the editor of the blog Peearage News, Michael Rhodes, has put it, «The idea that the Sussexes are breaking ‘protocol’ and ‘royal tradition’ by having a private royal birth is wrong. The hospital photo shoot is a modern move. The birth of the Queen’s children were private affairs. Edward wasn’t seen in public until he was 3 months old.» Rhodes later went on by writing that «If some people understood the difference in the words ‘private’ and ‘secret’ then the Duke & Duchess of Sussex would not be suffering from the barrage of criticism thrown at them by irrate Twitterers....and Press». I couldn't have said it better myself. I think the parents to be have made a wise decision. We will get the happy news soon enough anyway. Many people have asked about possible royal titles for the Sussex baby. As no press release concerning a Letters Patent has been given yet, I think we can safely assume that the Sussex baby will not become a Prince or Princess. This means that the baby, if a girl, will be styled Lady X Mountbatten-Windsor, while a boy by courtesy will be styled Earl of Dumbarton, which is the Duke of Sussex's second (lesser grade) title. For the record, when I commented on the title issue back in October, I didn't make any predictions on what the Queen would decide. I only wrote what I personally thought would be the best solution. The number of «working royals» are bound to drop for natural reasons in the years to come, so in that regard it would be wise to give a royal title to the Sussex baby as well. Many have argued that the Letters Patent published in January 2013 signalled that only the children of the Duke and Duchess of Cambridge would be Prince or Princess. I other words, the LP would have been worded differently if all possible grandchildren of the Prince of Wales were to receive a royal title. That is a reasonable argument. However, there is nothing that could have stopped the Queen from changing her mind some time in the future if she saw it necessary. At the time Prince Harry had not settled down anyway. There are good arguments for limiting the number of Princes and Princesses, but there are in my opinion equally good reasons for including the Sussex baby. As it stands today, the future Sussex baby, whether it be Earl of Dumbarton or Lady X Mountbatten-Windsor, will in accordance with the terms of the Letters Patent of 30 November 1917 become Prince or Princess when the Prince of Wales succeeds to the throne. But it is not unreasonable to expect that the Letters Patent in due time will be modified to reduce the number of potential princes and princesses, or that the monarch in some form or another will «let it be known» that the Sussex baby will continue using «the birth title» under the new reign even without a changed LP. We will obviously know sooner or later. The Grand Ducal Court of Luxembourg announced on 5 April 2019 that the divorce between Prince Louis and Princess Tessy became final the day before, 4 April 2019. The divorce was covered by the local press, among others Wort.lu, following the statement and has also been written about in other blogs, like Marlene Koenig's (go also here) and Luxarazzi (see also a follow-up). But «for the record» I mention it also in my own blog. Prince Louis married Tessy Antony in 2006. The decision to get a divorce was made public in January 2017, and a decree nisi was granted om 17 February 2017. Since then the former couple has been in a conflict over the financial settlement, which now is solved. According to the press statement referred to above, Tessy has as a result of the divorce ceased to be a Princess of Luxembourg with the style Royal Highness, and she will not represent the Grand Ducal family anylonger. It's been a while, anyway. For the sake of the children, Prince Gabriel and Prince Noah of Nassau (born 2006 and 2007 respectively), Tessy will be allowed to use the hyphenated surname Antony-de Nassau taking effect from September 2019. I am not sure why she has to wait so long, but it might be because Luxembourg law concerning name changes works that way. She is referred to as «Mrs. Tessy Antony» in the statement, but if it takes so long to get a new surname in Luxembourg, how is it possible to lose the surname de Nassau so quickly? She seems to believe that she is a Princess until September, although this is in conflict with the said press statement and house law. The name of her Instagram account is «Tessy from Luxembourg», by the way, while she at present calls herself «Tessy Antony, Princess de Luxembourg» on Twitter. I hope there will be more information on the issue in due time. Updated on 8 April 2019 at 23:53 (reference to Tessy's Twitter account added). It is Hanover time! Or should I say Cumberland time? 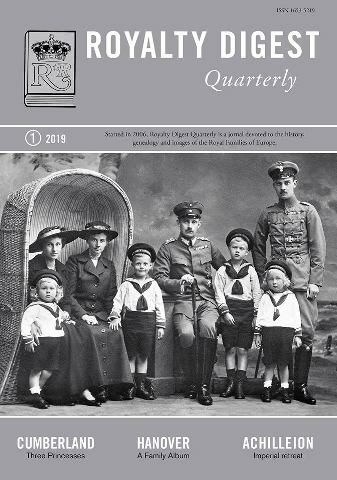 The latest issue of Royalty Digest Quarterly – no. 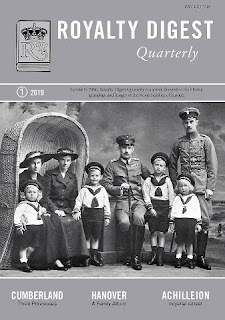 1, 2019 – has a cover photo of Ernst August of Hanover, Duke of Brunswick and his sister Alexandra, Grand Duchess of Mecklenburg-Schwerin with their partners and children. The photo was taken in 1917. And the redo is properly done indeed, with the traditional introduction to the family besides a large collection of photos of the members of the royal house and the palaces – 84 in all – as well as 6 pages with genealogical tables. Cleverly enough, the editor has also included the article The Cumberland Princesses by Marlene A. Eilers-Koenig. In his Editor's Corner Ted Rosvall dwells on abdications in royal Europe prior to WW1 and lists examples from among others France, Spain and Austria. He could of course have mentioned abdications closer to his home country, such as King Christian Frederik's abdication of the Norwegian throne in 1814 and King Oscar II's of the same in 1905. The reason for Rosvall's list is to point to the second part of Bearn Bilker's The November 1918 Abdications, which is included in the present issue. I really enjoyed the first part published in no. 4, 2018, and Bilker delivers once again! This time we can read about the abdications in Saxe-Weimar, Hesse and by Rhine, Württemberg, Saxony, Mecklenburg and Waldeck-Pyrmont. Concerning the royal house of Saxony, Bilker correctly points out that the royal house is now extinct while one morganatic branch still remains. Oddly enough the editor has included a photo of «Prince Alexander of Sachsen-Gessaphe» (Alexander de Afif), who claimed the headship following the death of his uncle, Maria Emanuel, Margrave of Meißen, in 2012. But otherwise de Afif is not mentioned at all. It is a trifle, though, but it might have been more fitting to include a photo of either Maria Emanuel or Albert. In the last issue of 2018, Stefan Haderer was the author of the article A Fairytale Palace on Corfu. I: The Achilleion and Empress Elisabeth of Austria. This time Haderer returns with the second part, The Achilleion and German Emperor Wilhelm II. It is once again worth reading, and the information that the Achilleion and its park today is a museum certainly tempts my desire to visit Corfu one day. Bearn Bilker has also made a second contribution this time – a review of John van der Kiste's book Daughter of Prussia. Louise, Grand Duchess of Baden and her family (A&F Publications, South Brent Devon, UK, 2017, ISBN 978-1546960379). As of today the Kindle edition only costs USD 5,61, the paperback edition USD 10,09. The editor has found space for two of his own (smaller) articles this time: Royal Monograms, based on and old album containing a large collection of among others royal and noble monograms and which he found in a second hand book store many years ago, and Little-Known Royals. Prince Erik of Sweden. Finally the readers are treated with The World Wide Web of Royalty, the column covering genealogical news of the Imperial, royal, princely and/or mediatized houses of Europe, this time Austria, Castell-Rüdenhausen, France, Fürstenberg. Hohenzollern, Luxembourg and Spain (or France again, depending on your view on Luis Alfonso, Duke of Anjou's claims). In other words, plenty of good articles to read this time as well! Updated on Thursday 4 April 2019 at 21.20 (reference to Cumberland article corrected, see comments section). Their Royal Highnesses will use the title The Earl and Countess of Forfar when in Scotland. The Earldom of Forfar was created in 1661 and became extinct as a title in 1715. It was a subsidiary title to the Earl of Ormond and was a title held by the Douglas Family. The 1st Earl of Forfar (1653 to 1712) was Archibald Douglas. His son, also Archibald Douglas, became the 2nd Earl of Forfar (1692 to 1715). The 2nd Earl took the title at the age of 20 and died without issue leaving the Earldom, part of the Peerage of Scotland, extinct. Forfar is the county town of Angus with a population of just over 14,000. It is the principal county town nearest to Glamis Castle, the seat of the Earls of Strathmore and Kinghorne. It was this family of which the late Queen Elizabeth The Queen Mother was part. According to Michael Rhodes, who is behind the blog Peerage News, the Earl of Wessex is «a fifth cousin nine times removed of the previous holder of that peerage». TITLE OF HRH THE PRINCE EDWARD The Queen has today been pleased to confer an Earldom on The Prince Edward. His titles will be Earl of Wessex and Viscount Severn. The Prince Edward thus becomes His Royal Highness The Earl of Wessex and Miss Sophie Rhys-Jones on marriage will become Her Royal Highness The Countess of Wessex. The Queen, The Duke of Edinburgh and The Prince of Wales have also agreed that The Prince Edward should be given the Dukedom of Edinburgh in due course, when the present title now held by Prince Philip eventually reverts to the Crown. The Queen has also decided, with the agreement of The Prince Edward and Miss Rhys-Jones, that any children they might have should not be given the style His or Her Royal Highness, but would have courtesy titles as sons or daughters of an Earl. To be released at 12 noon BST Saturday 19th June, 1999. The Prince of Wales as the eldest son of the title holder is the present heir to the title Duke of Edinburgh. This mean that the Prince of Wales will inherit the title on the death of his father. If this happens while the Queen is still alive, the Prince of Wales will just add the Duke of Edinburgh title to his other titles. When he becomes King, the title will merge with the Crown. If Prince Philip outlives the Queen, then the title will eventually pass on to the Prince of Wales, but as he by then is already the King, the title will merge with the Crown. Only then the title can be recreated for the Earl of Wessex. The Telegraph also refers to the ongoing «war» between the «supporters» of the two duchesses. I have noted that many Boardhost forum regulars and others have also been dragged into this conflict. I am happy to stay out of it! Another matter is how this «Sussex vs. Cambridge war» goes against the very concept of monarchy. Many of the «warriors» seem to have a very shallow understanding of monarchy, monarchism and the roles of the royals. I don't think the lack of formal guidelines would have stopped the British Royal Court from blocking or reporting offensive postings, but at least from now on the trolls and haters can not claim that they have not been warned! Preparations are under way for the abdication of Emperor Akihito of Japan on 30 April 2019. One question that naturally has arised is what to call them afterwards. Last week The Japan Times wrote, with the Imperial Household Agency as the stated source, that Emperor Akihito will be referred to as «Emperor emeritus», while his wife, Empress Michiko will use the title «Empress emerita». The Japanese equvialents will be jōkō (上皇) and jōkōgō (上皇后) respectively. The similar practice in Europe varies. While the Dutch monarchs traditionally reverts to the title of prince or princess* following abdication, King Juan Carlos of Spain, King Albert of the Belgians and Grand Duke Jean of Luxembourg are still titled King or Grand Duke respectively, but they are of course not HM The King or HRH The Grand Duke anylonger. A parallell to Japan would be the Roman-Catholic Church, where Pope Benedixt XVI is referred to as «supreme pontiff emeritus». * The three monarchs prior to King Willem-Alexander were all women – Queen Wilhelmina, Queen Juliana and Queen Beatrix respectively – and they all reverted to the title of Princess of the Netherlands following their abdication. I mention the title prince the just for «the sake of balance and equality» and because I expect that King Willem-Alexander will use the title of Prince again if he should decide to abdicate some time in the future. As far as I know, the first King of the Netherlands, Willem I, continued to use the title King following his abdication in 1840. 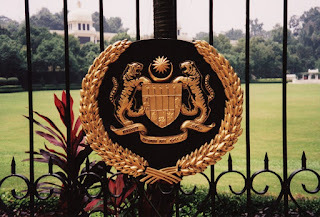 The closest I got to the Royal Palace (Istana Negara) in Kuala Lumpur ... © 2004 Dag Trygsland Hoelseth. The Sultan of Pahang, Abdullah Ri'ayatuddin, was sworn in as the 16th Yang di-Pertuan Agong (King/Head of state) of Malaysia in Kuala Lumpur, the capital of Malaysia, today, following his election by the Conference of Rulers last Thursday. At the same time the Sultan of Perak, Nazrin Muizzuddin Shah, took the oath following the re-election as Timbalan Yang di-Pertuan Agong (Deputy King/Head of state). The previous king, Muhammad V, Sultan of Kelantan, abdicated the throne on 6 January 2019, and the Timbalan Yang di-Pertuan Agong acted as Head of state until today. The new Yang di-Pertuan Agong of Malaysia, Abdullah Ri'ayatuddin, b. 30 July 1959, succeeded as Sultan of Pahang as recent as 15 January 2019 following the abdication of his father, Sultan Ahmad. Abdullah has been married to Tunku Azizah Aminah Maimunah Iskandariah Sultan Iskandar, b 5 August 1960, since 6 March 1986. 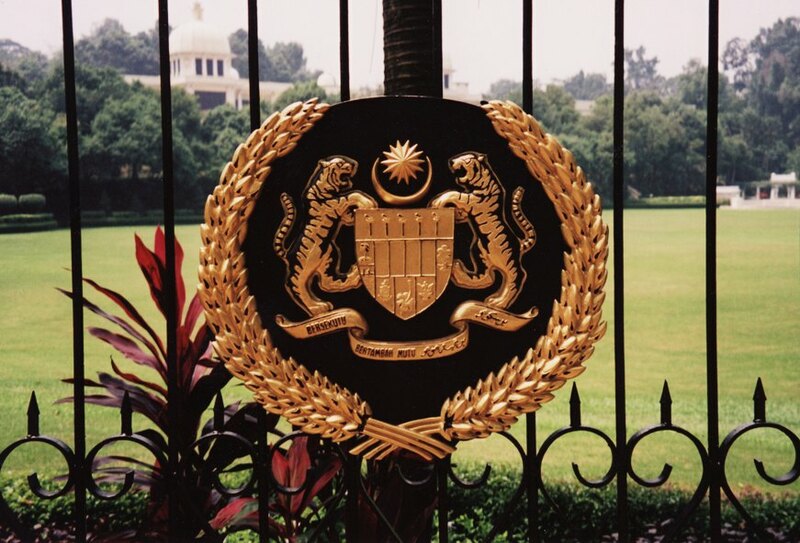 His second wife, since 1993, is named Cik Puan Julia Aisha binti ‘Abdu’llah, b. 1971. His first wife will act as the official consort (titled Raja permaisuri Agong). The Sultan of Pahang has six children by his first wife and three by his second, cf. The Royal Ark. In addition he has also two adopted sons born prior to his children by his first wife. The new King is described as a huge football fan and a supporter of the English football team Arsenal FC. According to the newspaper The Star, «Sultan Abdullah, who is quite a skilful midfielder in football, is just as adept at hockey, tennis, golf, horse riding, scuba diving, squash and polo». Today's events in Kuala Lumpur means that I have updated my Longest reigns (current monarchs) page. If nothing happens in the meantime, the website will be updated again in late April when the Emperor of Japan, Akihito, abdicates.